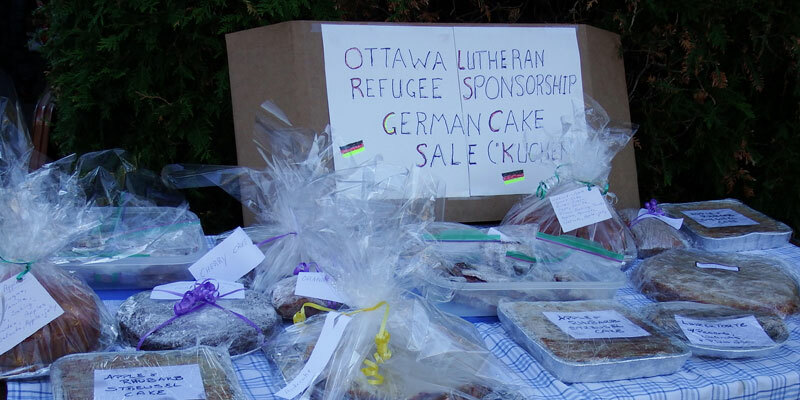 Our congregation supports the Ottawa Lutheran Refugee Sponsorship Committee which enables refugees to come to Canada through private sponsorship. Several members of our congregation are Committee members. The annual fundraisers of the Committee are supported with donations or personal involvement by many members of our congregation (for example baking for the bake sales, helping at the sales booth or donating and storing furniture for accomodation for newcomers) and by participating in occasions like the fundraiser-dinner. The sponsorship of the refugee committee is a guarantee to provide all the financial and settlement supports for one year. Through this private sponsorship the refugees obtain permission to come to Canada and stay here. During this first year the Committee and its supporters help the newcomers in every possible way. The goal is that after this year the newcomers have become independent, have found a job, have arranged themselves with language and culture and bureaucracy, have enrolled their children in school if they came with children, are registered for ESL classes if needed, got health cards, found a doctor and feel to be in good hands in Canada. The families which have been supported most recently originally came from Syria and Eritrea and have spent several years in refugee camps. You are most welcome if you would like to support the work of the Committee and to receive information about it on a regular basis. Please contact the church office or send an e-mail to lutherinfo@gmail.com.